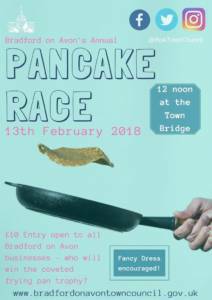 The Bradford on Avon Pancake Day Race is a firm favourite in our events calendar. Every year on Shrove Tuesday, Bradford on Avon businesses get competitive with their neighbours in a fast and furious pancake flipping race. There’s a minimum donation of £10 per entrant and any profits raised will go towards the 2018 Christmas lights display. So whether you are a Sole Trader, run, or are part of a business in Bradford on Avon, register now, dress up and bring a frying pan to the Town Bridge Bus Stop at 12noon for a photo call with the press and then the race will commence! We will provide the pancakes and present the ‘Frying Pan Trophy’ to the winner.